RE20, Dynamic Microphone from Electro-Voice. Rick Dinsmore's review"Worth Every Penny"
Using the RE20 for podcasts and audiobooks. 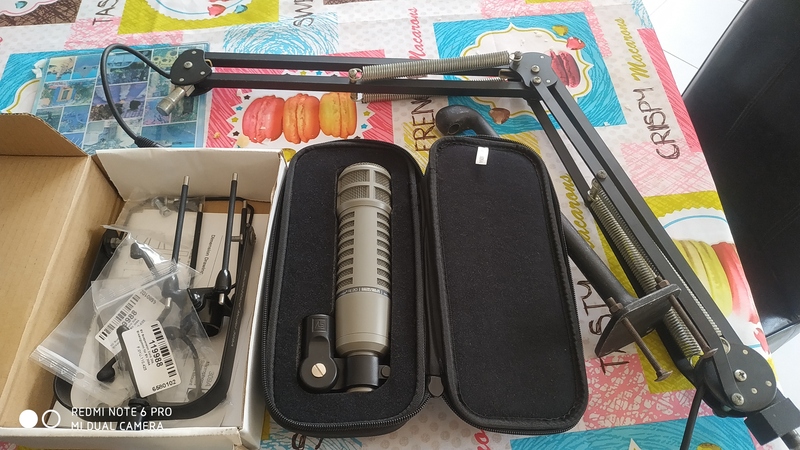 Switched from Rode Procaster which is a wonderful microphone with a distinctive character that didn't quite suit my voice. The RE20 was a much bigger jump in quality of audio than I anticipated and is very smooth, and free of artifacts. A very forgiving microphone. Not cheap, but it will be the last mic you will buy. The only con is the ridiculous cost of the shock mount, but there are now after market ones that fit for as low as 25 bucks, I found one and it works just fine. 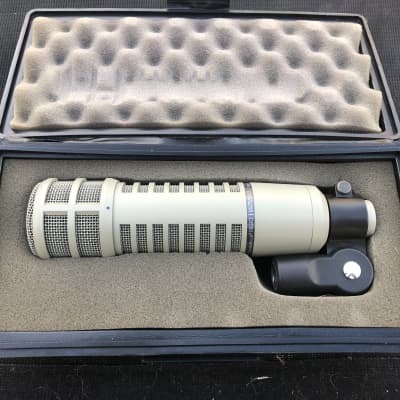 mrjason's review"one of the best all around microphones that I have used"
The Electro Voice RE20 is a dynamic microphone with a cardioids polar pattern. The casing is made out of steal and you don’t have to worry at all about this microphone getting damaged from a drop/fall. The microphone is built to last a long time and it is great in so many different situations. 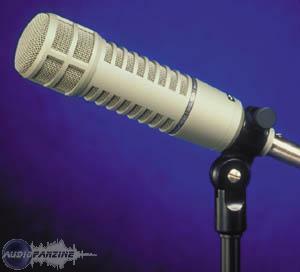 The RE20 is truly a work horse type of microphone, it can do it all and do it well. You can use this microphone on kick drums, vocals, bass and guitar cabinets. 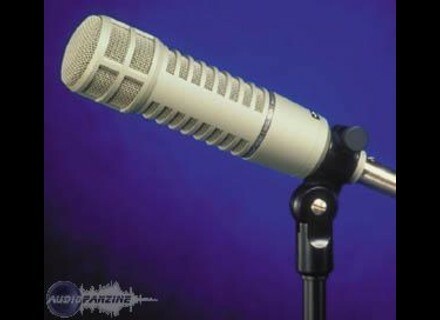 Since we have had this microphone we really have not found something that it is not good at. This open circuit dynamic microphone has an impedance of 150 ohms and a frequency response of 45Hz-18 kHz. I love the way this microphone sounds on our Pearl kick, it brings that thump while still keeping the sound punchy. We don’t even have to mess with the EQ at all when we record kicks with the Electro Voice RE20. 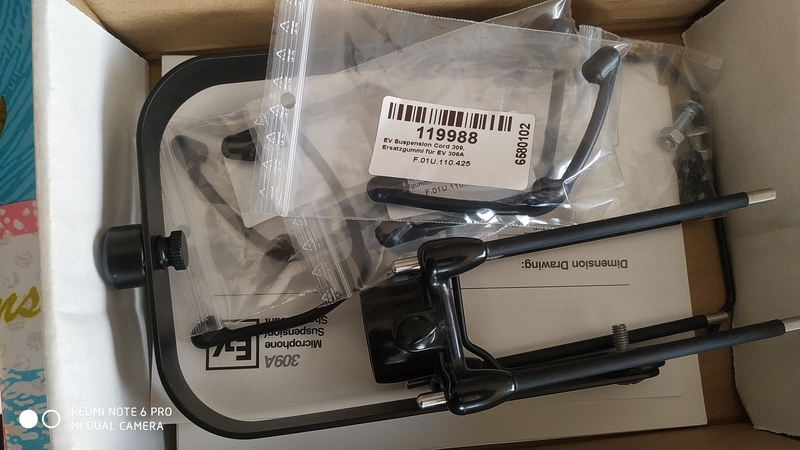 Depending on what your main use for this microphone is I do suggest getting a good quality shock mount for it, Electro Voice does make a shock mount for it but you have to pay for it separately and it is not cheap. The shock mount itself will cost you a little over a hundred dollars. Since you can use this microphone for almost any applications, live or studio; it makes it a must have for any band or group that is a dynamic group recording not only vocals but instruments as well. You will need a microphone that can handle whatever you throw at it and the RE20 is just that. 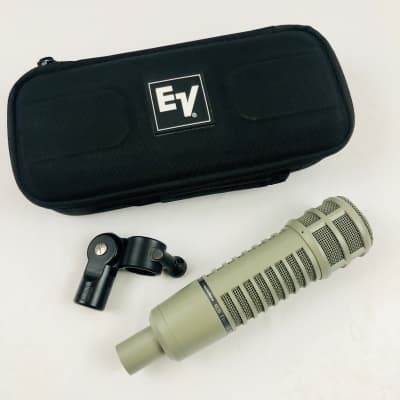 I was not too sold on Electro Voice microphones before we got this one, but since we have been using it I have to respect the company now because this is by far one of the best all around microphones that I have used. Great Mic for kick drum and broadcast. This was the mic you hear on kick drums for the last three decades and to this day on most all broadcast radio talk shows. When you add compression to an RE 20 you will hear wonderful things from this mic. It has a bump on the low mid so it is great for kicks. Polar Pattern Cardioid is all you get from this mic as for patterns. Broadcast stations all over the world for 30 years have been using this mic for years and again it is the standard mic for broadcast in the world. I have never been to a top radio station that does not use the RE20 for broadcast voice. I love the sound of this mic but it does get a great deal of low mid sound so if you are using it on a kick drum you will have to cut about 220hz a great deal maybe even 15 db. Recently we had a few kick mics and a great deal of time to test some mics for a recent project. 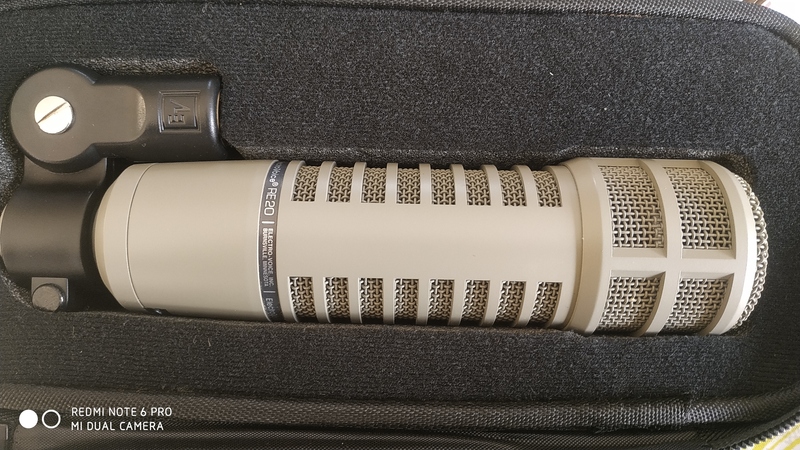 I was surprised that I wanted to try the RE20 as I have moved on to other mics in recent years that have caught my attention or that are well priced and that I have heard on YouTube or from recommendations from business associates in the engineering community. I will say that I really enjoyed the A and B testing we did recently. I took a D110 and had it inside the kick drum about three inches away from the beater but placed inside the kick really close. I got the drummer to do three tests one whereby he hit the drum soft the next harder and the last really hard. The D110 had tons of low end but lacked the presence that I desire in a kick drum. I turned to the RE20 and place it at the same point on the kick drum but inside the kick. I had the drummer do the exact same thing regarding the three hits on the kick drum. I was surprised at the presence of the kick drum and it reminded me of the 1980's whereby we would use this kick sound every day and the only mic we had for kick was the RE20. Back then it was the standard for kick mics, like if you listen to the first Van Halen records or Fleetwood Mac you can hear an RE20. A must have for broadcast or kick drum or bass amp micing. Can take hot levels and sounds fantastic. Not the best for lead vocals on music though. The Electro-Voice RE20 is a dynamic cardioid microphone so it is limited and you should know that. Like I said it was created specially for recording, broadcast and sometimes live for horns and kick. It does have a bass enhanced sound so be aware of that when you buy this mic but if you want a great mic for about 400.00 Ebay. GOOD BUY. Electro-Voice RE20 Classic Cardioid Dynamic Microphone is a recording and live type of microphone that is used world wide. It uses a condenser technology. 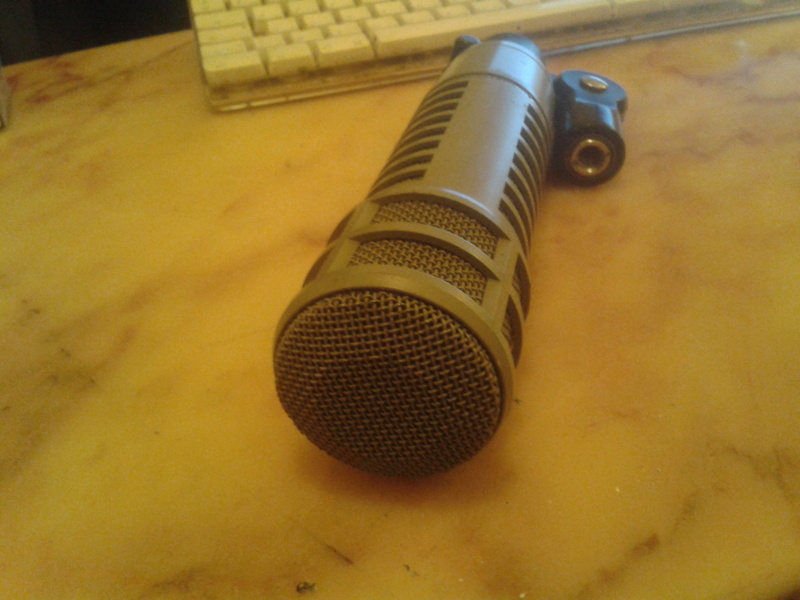 The thing that I like most about it is how well it captures the sounds, the wide frequency response , and of course the material of what is made that is extremely solid and heavy which I find very importantly in terms of using the mic in random studios and places. Another great features of this product is that it has an internal pop filter that reduce proximity effect while the internal element shock mount reduces the noise from the external source. Pianos, Strings, Ensembles, Flute, Snare , acoustic guitar, electric guitar, and all types of percussion. Practically, you just plug in and with some compression and eq you almost have the job done, that's how good this mic is, and that's how you can rate the mic by it's use and quality of sound. Electro-Voice RE20 Classic Cardioid Dynamic Microphone because it provides that pro quality that you find in expensive studios, basically the precision and capture of the sounds is almost perfect, it has a deep frequency response so no matter what type of voice you have, you're an bass, tenor, alto, countertenor , soprano, high soprano, this mic will capture exactly what you're wanting. I've tried several dynamic and condenser mic's , I'm really thankful that I had the pleasure to work with this mic on my friend's studio. It sounds great and well-detailed.